DUP leader Peter Robinson warned this week he would collapse the Stormont assembly unless Sinn Fein ‘delivers’ on parades to his party’s satisfaction by the end of this month. Meanwhile, Sinn Fein President Gerry Adams said yesterday he would sit on the Garvaghy Road to stop the Orange Order from marching along the flashpoint route. A working group of six assembly members from Sinn Fein and the DUP must publish its recommendations on new structures to determine the routes of sectarian parades within three weeks. 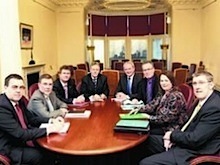 Sinn Fein assembly member Gerry Kelly said a schedule of work had been agreed and the atmosphere was “businesslike”. “We have not said that we will sort out the issue of contentious parades in two or three weeks. We will try to put together a structure that will make it easier,” he said. “It has to be sorted out between the residents and the people who march in those areas making dialogue and resolution easier. The ‘Parades Working Group’ comprises Stephen Moutray, Nelson McCausland, Jeffrey Donaldson of the DUP, and Gerry Kelly, Michelle Gildernew and John O’Dowd from Sinn Fein. Following last week’s Hillsborough Agreement, the new framework being sought by the group could replace the Parades Commission. The abolition of the commission was named by the DUP last year as a key precondition for the transfer of policing and justice powers from London to Belfast. The Parades Commission has been criticised by unionists for preventing coat-trailing marches by the Protestant Orange Order in nationalist areas such as the Garvaghy Road in Portadown, where they are bitterly opposed. The DUP has defended the Orange Order parades as “traditional”. Mr Kelly, a junior minister in the office of the First Minister and Deputy First Minister, said they planned to involve other “stakeholders” but were reporting to the First Minister Peter Robinson and Deputy First Minister Martin McGuinness. “The agreement was hard fought for. We intend to move forward with as much speed as possible because we know this is important,” he said. The first meeting yesterday lasted around an hour. DUP hardliner Jeffrey Donaldson claimed the parades group would complete its work next week. “The decisions we take as a working group will not be taken in a vacuum. They will be informed and influenced by those involved in parading, that is why we will be listening to those views and reflecting them in the final agree ment,” he said. He claimed that a resolution to the issue was essential to build “public confidence” and that the timetable agreed at Hillsborough must be adhered to. DUP leader Peter Robinson has warned he will collapse the Stormont assembly unless Sinn Fein lives up to the deal on parades to his party’s satisfaction. “l think everybody has recognised that there are methods available, particularly to the two main parties in this assembly, which can be used at any and all times if they wish to bring down institutions to make sure that things don’t work, to act as vetoes,” he told the assembly as he outlined details or Friday’s settle ment on devolving policing and justice powers. Elaborating on his reference last week to a “secret device” he had to ensure Sinn Fein compliance, Mr Robinson cited the example of former Ulster Unionist Party leader David Trimble, who triggered the suspension of the assembly after resigning on the issue of IRA decommissioning, and recent speculation a similar move could be taken by Sinn Fein Deputy First Minister Martin McGuinness. It is understood the device is now two-pronged: if the review of loyalist parading is not completed in time, the DUP will not allow devolution of policing and justice to go ahead on the agreed date of April 12; and if Sinn Fein object to DUP demands after policing and justice powers are transferred, the DUP -- depending on a favourable result in the British general election -- could ensure the move is reversed by collapsing the Stormont Executive. Mr McGuinness told the Assembly his party would not shirk its responsibilities. “I travel with hope and optimism. I look on the bright side and whenever this party makes commitments, we are absolutely dedicated to keeping those commitments,” he said. DUP hardliner Gregory Campbell said as a result of Sinn Fein’s “walking out of the talks on the final week” the party had ensured that the issues of parades and policing remain linked. “We will ensure, both at the outset of the Assembly process on parading and policing and justice, and then throughout the process, a decision rests with us over which Sinn Fein have no control, that ensures the direct linkage of the two matters. Gerry Adams appeared to rule out a parade along the mainly nationalist Garvaghy road in Portadown at least. The march will only happen if residents invite the Orange Order to use the route, he said. “Unless the people of Garvaghy Road invite the Orangemen to march up that road there won’t be any parade and if there was a parade against the wishes of the people I would be sitting with them in the middle of the road -- and I am someone who wants to reach out to the Orange and wants to see the contention taken out of all of this,” Mr Adams said.